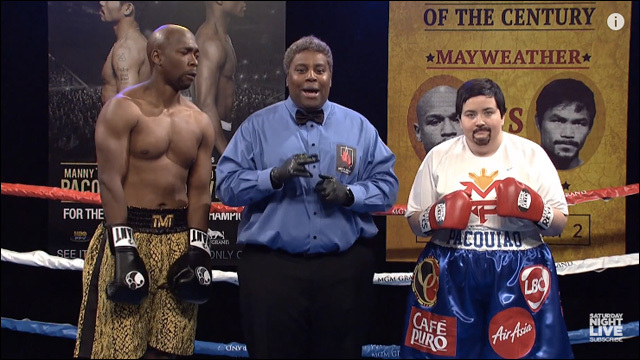 'Saturday Night Live' spoofs Maywather/Pacquiao fight... with Aidy Brant as Manny. According to the scrolling disclaimer, "Because this is a pirated broadcast of the fight, some of the visuals may appear distorted. For example... Manny Pacquiao may appear to be a white woman with a fake goatee and a t-shirt." Like I said, not even trying. Could this be laziest sketch Saturday Night Live has ever produced? Turns out, this was not too far off from what transpired in the actual fight. Zzzzzz.